Introducing a delivery app for everything. Agohra can bring it to you, wherever and whenever you need it. The perfect shopping experience: none. Last-minute emergency? Too busy to run to the store? Agohra makes it easy for shoppers to get whatever they need. Just list your desired items, let drivers bid on your orders, choose the best offer, and enjoy fast, hassle-free delivery. Agohra lets you earn on your own schedule. Make good money cruising around your city, listening to your favorite tunes and bringing people the things that they love. Choose from thousands of products you regularly buy from local stores you trust. Select your preferred delivery time and pickup address..
Once you post your order, drivers bid for the chance to deliver. Just pick the offer you like best, and your driver will bring it to the address you chose. Your driver will head over to a local store, grab your items, and bring them to the specified address in the time frame you requested. Easy peasy! Once you've received your items, you can easily pay your driver via the app. You’ll be charged what's on the receipt, plus a pre-approved delivery fee. 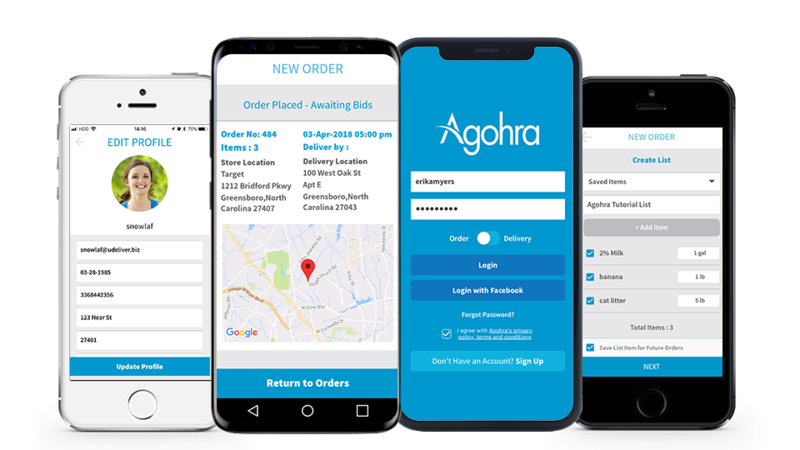 Deliver with Agohra and be your own boss. As an Agohra driver, you’ll work on your own terms and run your own schedule. Mornings, afternoons, weekends–whenever you have spare time, Agohra lets you turn it into extra cash. When you see an order you’d like to fill, you’ll submit a bid with your proposed delivery fee and time estimate. Once a shopper accepts your bid, you’ll head to the store, purchase the items, and take them to their destination. You’ll be part driver, part shopper, all business. You handle the wheel. We’ll handle the rest. Don’t worry about collecting the right payment for the items you deliver. Just snap a picture of the receipt and the app will process the transaction. Ready to get rolling with Agohra? Apply today to unlock your next side gig. Submit your contact info, and we’ll reach out shortly. You can also apply via the app, if you like. Questions or comments? First, be sure to check out our FAQ. If we haven’t already answered your question, reach out by clicking the button below. Does it cost anything to use Agohra? No. There is no membership fee to use Agohra, and the app can be downloaded for free. We do take a small commission from the delivery fees. Where can I use Agohra? We are rapidly expanding our delivery range from our home base of central North Carolina. All we need in order to expand is you! Agohra can be used anywhere that there are shoppers and drivers ready to use it—so spread the word! There’s no need to grab your wallet when you receive your order—all transactions occur through the app. Drivers will receive payments electronically to their bank accounts. Do I need to ask the store to gather my items? No. Your delivery driver will locate and purchase your items, just as you ordinarily would. There is no need to contact the store. Are there any items which are not available for delivery? Unfortunately, we cannot deliver alcohol or prescription medications at this time. Jet aircraft won’t fit into our cars, and all pandas belong to China, so those are off-limits, too. Sorry. All of our drivers are verified with background checks, and shoppers can choose where and when they would like to meet. As long as basic safety tips are followed, Agohra is no less safe than any other delivery service. How do I know the price of an item? When an Agohra driver purchases something for you, he or she will take a picture of the receipt. Our software then recognizes the total as the price you pay. Therefore, prices are always exactly whatever your local store is charging, without any upcharges. How do I choose the best offer? What constitutes the “best” bid is completely up to you! You might prefer a driver who charges a lower price, or you might be willing to pay a little more for faster service. We leave it up to drivers and shoppers to determine what is fair for them. Every driver determines his or her delivery fee. You can select the fee that seems the most reasonable to you. For instance, you might be willing to pay a little more for a faster trip. Can Agohra leave packages at my home when I'm away? You must be present to accept your order and confirm payment. We don’t want to worry about Fido eating your order while you’re gone. Can I have a package delivered to someone else? Yes! Agohra can deliver food, gifts, flowers, or anything else to any address that has a human present to receive them. 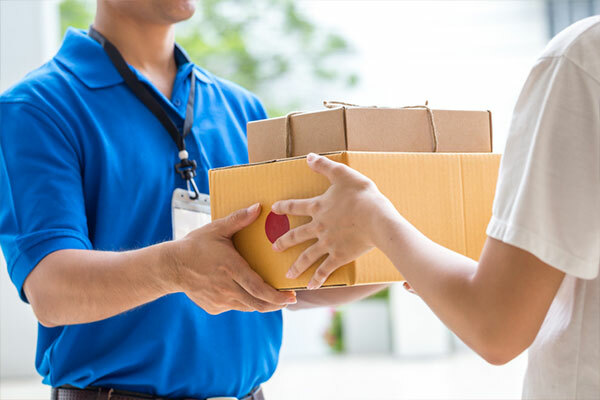 Send stuff to your mom, coworkers, friends, or grandma—just be aware, however, that we can’t leave packages on doorsteps while recipients are away. Can I deliver something to my dog? As long as there is a human guardian present to sign off on the order, yes. Ready to get started? Agohra is now available for free on Google Play or in the App Store. Shopping with Agohra is a snap. Here’s a brief walkthrough designed to guide you through using the app for the first time. Thanks for your interest in joining the Agohra Go Team! This tutorial is designed to help you fulfill your first order.